I am currently learning that being a Mother means sacrificing any hope of having a relaxing meal while in the company of your child for approximately five to ten years. Monday night's seder was certainly no exception. As I detailed in yesterday's post, the Muffin Man was not at his best. As a result I was frazzled, exhausted and half paying attention to anything that didn't involve bribing my son to stay quiet long enough for the other guests to hear one page of the Haggadah without the accompanying wails of an overtired toddler. A big part of each Passover seder is the consumption of a significant amount of (Kosher) wine, which probably explains why I've always enjoyed this particular holiday. While the adult guests are expected to polish off a few bottles of vino by the end of the meal, the younger not-yet-a-man set receive glasses of grape juice. 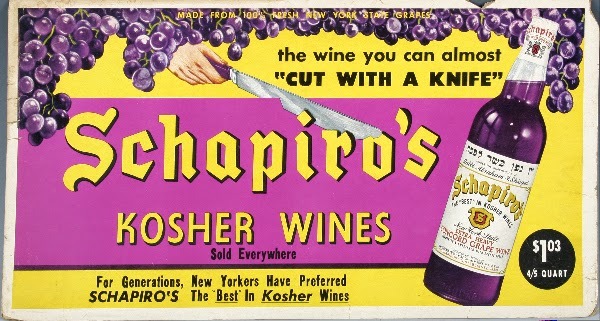 For those of my dear readers who are not members of the tribe or who have never been to a seder, let me just preface this by explaining that kosher wine and kosher grape juice are the exact same color. I suppose in good lighting and with younger eyes one might detect a slight variation, but to me they appear interchangeable. Therefore, when the cups were doled out to everyone sitting at the table, I assumed that Noah had received one holding grape juice. I poured some water into the glass to cut the juice and handed it to him, assuming that he would react in the same way he'd reacted to everything else that night and either reject it out of hand or fling it back in my face. I was pleasantly surprised when, for the first time all evening, my son finally quieted down. He was so busy guzzling the delicious sugar-filled nectar of the grape Gods that he couldn't open his mouth to complain or even spare a hand to throw matzoh across the room. Just as Noah was draining the last of his cup, someone came by to offer him a glass of grape juice. When I explained that he had already received one, the hostess looked at me in horror and told me that she hadn't poured any prior to this and had only given out cups of wine. Oh, excellent. While I was taking a moment to relax and thank whoever was smart enough to invent grape juice, my kid had been lapping up a significant portion of wine. I quickly grabbed the cup out of Noah's hand, hoping against hope that he had not consumed so much alcohol that I would have to take him to the hospital and risk his being taken from me by the Department of Children and Family Services. Well folks, the apple must not fall far from the tree because my kid had sucked that cup dry. I'm pretty sure had I not grabbed it from his sweaty grip that he would've actually taken the time to lick the last few droplets of wine from the sides of the glass. Let me just say that Noah was none too thrilled to have his beverage snatched unexpectedly from his his hands, despite my promptly replacing the cup o' booze with one filled with grape juice. That was essentially the beginning of the end of our Passover evening, since Noah screaming for more wine combined with my anxiety over having inadvertently allowed my child to drink enough alcohol to get a sorority girl tipsy didn't make us the best party guests. Thankfully, he doesn't seem to have sustained any lasting damage from his Passover bender, though I am planning to look into whether there's an AA meeting for the five and under set, just in case. I have a feeling I'm doomed to only attending 1/3 of every seder from now until they turn 13 or so. More wine for everybody else, I suppose!